Increasing levels of atmospheric CO2 are causing the increasing acidification of our oceans, to the rising concern of many scientists. Unrelated to climate change, this is an issue of basic chemistry: atmospheric CO2 is absorbed by and reacts with seawater to form carbonic acid (H2CO3). Increasing acidity could have profound affects on basic marine life. Concern about this effect began to accelerate in 2003. A short paper, published then by researchers at Lawrence Livermore National Laboratory in the journal Nature, suggested that unabated anthropogenic increases in CO2 in the atmosphere may drive changes in ocean pH values greater than any experienced in the past 300 million years. A number of global scientific organizations have since recognized the importance of increasing acidification in surface oceans and are sponsoring research programs: the International Global Biosphere Programme (IGBP); the Scientific Committee on Oceanic Research (SCOR); the Commission On Atmospheric Chemistry and Global Pollution (CACGP); and the International Council for Science (ICS). SCOR and the Intergovernmental Oceanographic Commission (IOC—part of UNESCO) sponsored a Symposium on The Ocean in a High-CO2 World in May 2004. A subsequent report—Priorities for Research on the Ocean in a High-CO2 World—summarizes the symposium and puts forward its overwhelming conclusion as to the need for more research in this area. In August 2004, the Royal Society in the UK launched a study into “the potentially catastrophic consequences for marine life” caused by the increasing acidity of the oceans. The Royal Society report will be published this year. At the scientific conference Avoiding Dangerous Climate Change held this last week at the Met Office HQ in Exeter, Carol Turley of the Plymouth Marine Laboratory, a member of the Royal Society working group, presented a paper on the impact of increasing CO2-driven acidification on marine ecosystems. Yet another reason to push for greater reductions in CO2 emissions. 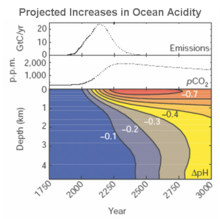 I was just taking a look here and it seems that the figure shown (Projected Increases in Ocean Acidity) plots a 0.4 pH decrease over the next thousand years. I believe that current models forsee such a change within a hundred years. Was just wondering if there was a type-o. hummer h1 <>] Today, more than 200 owners have undergone HOPE certification and many even assisted during the Hurricane Katrina disaster hummer accessory The H2 is also assembled in Kaliningrad, Russia, by Avtotor, starting in June 2004 fort worth hummer Also due out by about the end of the decade, it will again be developed off GM’s full-sized 1500/2500/Suburban truck platform detroit hummer Together, the two organizations train Hummer owners with CPR and First Aid skills, and basic off-highway skills so that they may assist victims during a disaster situation hummer philadelphia In fact, within the next three years, Hummer will offer bio-fuel powertrains "